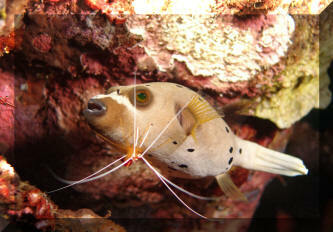 Arothron meleagris (Lacepede 1798), the Guinea Fowl Puffer. 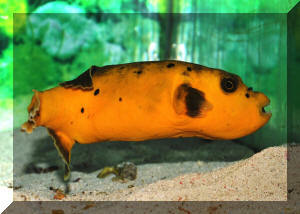 This is a "standard" offering in the pet fish trade, in black and white, golden and mottled color morphs. Found throughout the tropical Indo-Pacific. 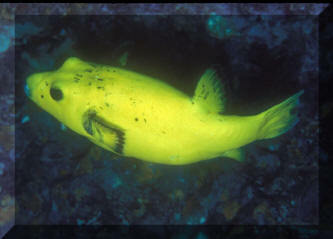 Below, first row are images of a "normal" individual in Hawai'i, a xanthic "gold" one in captivity, and a mottled "koi" one in Cabo San Lucas, Mexico. Second row, some examples of the species in the Galapagos. To twenty inches long in the wild. Arothron nigropunctatus (Bloch & Schneider 1801), the Blackspotted Puffer. Indo-Pacific. To thirteen inches long in the wild. 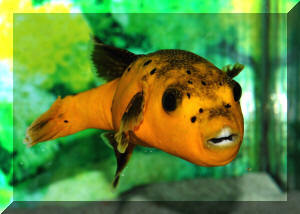 Likely a top-contender for the most commonly sold puffer in the aquarium interest. A great addition for a fish-only system. A "normal" and "koi" variety in Bunaken, Indonesia, and one sleeping on the bottom at night in Fiji.